Boot cuffs are just the thing to add a little spice to your style! Peeking just over your boot tops, they can be lacy, sporty, thick and warm, or delicate and feminine. Best of all, they are easy-to-knit tubes with minor shaping--no tricky foot as with a sock--so they knit up fast. They are great for trying out techniques like colorwork or lace on a small scale. And, of course, they are super-cute to wear and sure to draw comments wherever you go. 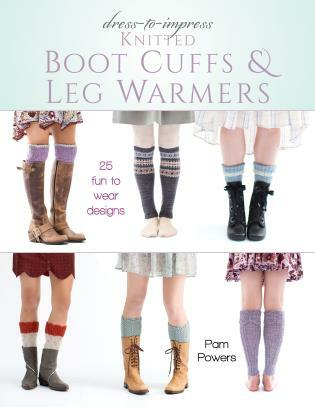 Pam Powers, author of Dress-to-Impress Knitted Scarves, brings her impeccable sense of style to this collection of 25 boot cuffs and leg warmers. You will want to make a pair (or two) for every day of the week. Knitwear designer Pam Powers has exposure of her innovative designs on her website pampowersknits.com, Ravelry, and Craftsy, as well as through yarn stores across the U.S. Her work has been featured in national magazines like Interweave Knits and Bel Armoire, as well as online in blogs and newsletters like Knitting Daily and Noble Knits. She lives in Orange, California.